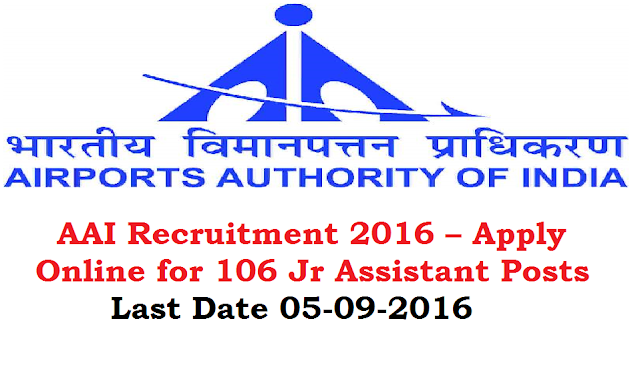 AAI Recruitment 2016 – Apply Online for 106 Jr Assistant Posts : Airports Authority of India (AAI) has published notification for the recruitment of 106 Junior Assistant (Fire Service) vacancies for candidates who are domicile of West Bengal, Bihar, Odisha, Chattisgarh, Jharkhand, Andaman & Nicobar and Sikkim States. Eligible candidates may apply online from 08-08-2016 at 10:00 hrs to 05-09-2016 by 18:00 hrs. Other details like age, educational qualification, selection process & how to apply are given below…. Age Limit: Candidates age limit should be between 18 – 30 years as on 30-06-2016. Relaxation of age will be applicable up to 05 years for SC/ ST & 03 years for OBC (Non Creamy layer) candidates and other relaxation details refer the notification. Educational Qualification: Candidates should have 10th Pass + 03 years approved Diploma in Mechanical/ Automobile/ Fire or 12th pass (Regular Study) with 50% marks. Application Fee: Candidates should pay Rs. 400/- for General and OBC candidates through challan by depositing in any branch of State Bank of India. Application fee will be exempted to Female, SC and ST candidates. How to Apply: Eligible candidates may apply online through the website www.aai.aero from 08-08-2016 at 10:00 hrs to 05-09-2016 by 18:00 hrs for Step I online registration & on or before 13-09-2016 by 18:00 hrs for Step II online registration.